Mark Cramer has been bicycling in Paris for more than 10 years. In this guest blog for Freewheeling France, he traces the growth of bicycle culture in the French capital. One of the goals was to improve air quality. Of the three greatest enemies of air quality (motor transport, heating and industry), they knew that motor transport was the greatest culprit. Detractors called Mr Baupin names like Mr Gridlock and “the Khmer Verte” (because he was a Green Party member). Facing constrained car space, some suburban drivers would surely choose to take the train into Paris. But most drivers from the suburbs refused to be socially engineered, especially commuters who would otherwise face the onerous bus-to-RER (suburban train)-to-metro trifecta in order to get to work. In denial, O’Rourke ignored the taxpayer health-care costs of car pollution. We cyclists were still outnumbered. Collectively we became a tool of idealistic Paris planners. As days and years passed, most Paris drivers learned to tolerate the increasing presence of cyclists while some cyclers tried to understand the plight of the driver and the potential for a turf war reached low tide. 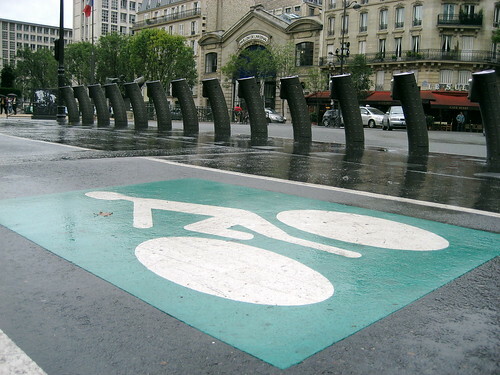 Bike paths all over Paris initially sparked a turf war between cyclists and motorists. Today, it's hard to imagine Paris without its cyclists. To avoid the increasing congestion, a significant number of drivers began downsizing to motorcycles. Motorcyclists and cyclists have one thing in common: we flow like water. Our circulation is a plumbing issue. If we reach a stoppage and there is a free canal (like a thin corridor between idling cars and parked cars), we flow in. Sometimes a bicyclist and motorcyclist decide to flow into the same cramped space at the same time. Whenever I aim for an opening, I first make sure there is no motorcycle darting from behind into the same narrow slot. I don’t trust my ears. The one time that a motorcycle stops making noise is the one time you need to hear it. By the mid-2000s, motorcyclists reached a critical mass. When confronting gridlock, motorcyclists would muscle in on a bicycle path. On one occasion, just across the river from Notre-Dame, a few motorcyclists in the narrow bicycle lane were squeezing past me with a sense of juvenile immortality. At a red light, I asked a traffic cop why our sacred bicycle lanes were being subjected to such blasphemy. She smiled. “There are so many motorcycles,” she shrugged, “that we can’t stop them.” That was one unintended consequence of City Hall’s social engineering. Then came Vélib, the bike sharing scheme championed by newly-elected Mayor Delanoë. You can pick up bikes all over the city, including in the near suburbs, and leave them at the Vélib parking nearest your destination. In the beginning, Vélib was a new toy, and users rode as if they were playing a video game. Car drivers, who also disobey the rules, were re-infuriated. Driver-cyclist friction reached high tide once more. As Vélib riders became savvier, the driver rage index subsided once more. Balancing both positive and negative results, air quality has modestly improved. Cultural gains are more remarkable. In the 10 years that I’ve been commuting, I have seen increasing numbers of old-timers cycling (I’m one of them), more women and more business people. We’re a long way from becoming Copenhagen, but the bicycle culture is taking hold. Mark has put together a short cycling in Paris safety quiz – see how you'd go cycling in Paris. Best time to roll: Sunday morning. The air is clean, you own the streets, and it’s almost as quiet as car-free Venise. But beware of broken bottles near curbs, the product of Saturday-night revellers. 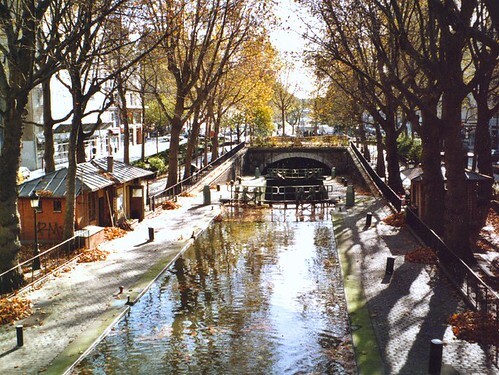 Canal Saint-Martin's protected bike paths make a scenic route. Eye-catching historical neighbourhoods away from the tourist core: Canal Saint-Martin, (10th and 11th Arrondissements, with protected bike paths), Buttes-au-Cailles (13th Arrondissement), Les Batignolles (17th Arrondissement, with bike markings): three partly gentrified neighborhoods that retain a village atmosphere. Country in the city: Bois de Vincennes (east side), Bois de Boulogne (west side) are obvious choices, but don’t miss the Promenade Plantée (Coulée Verte), an amazing green corridor with bicycle path, that gets you from Vincennes forest nearly all the way to Bastille, a treasure of landscape architecture that passes through the 12th Arrondissement. Places to avoid (when possible): When choosing tour routes, be aware that the densest pollution is near the outer motorway (the Périphérique), Champs-Elysées and Place de l’Opera. Those with asthma or anyone susceptible to respiratory problems should avoid these places. See how you'd go cycling in Paris – take our cycling in Paris safety quiz. Graham Robb (see our interview here), author of the excellent The Discovery of France, has written Parisians: An Adventure History of Paris, which includes Robb's discovery of a col in Paris. Some of the walks in City Walks Paris: 50 Adventures on Foot can be adapted to two wheels if you want to see Paris' key tourist sites by bike. See our where to stay section or zoom into the map below. Mark Cramer has written this article on great day and overnight trips around Ile-de-France that are accessible from Paris, plus this guide to getting out of Paris by bike. See also Bruce McAleer's Cycling Fontainebleau to Milly for a lovely dayride outside of Paris.